Working the figures as a freight broker requires knowledge, insight, sensitivity, creativity and good communications skills.Plus, a broker needs to crunch the numbers "on the fly". Some shippers want to tell you what they want to pay; some want you to quote them. Some carriers want to tell you what they need; others want you to tell them what you are paying. Nothing is set in stone outside of a contract. Some freight brokers use formulas. I started that way and quit. But whatever works for you, works. There is no one right way or best way other than the way that works for you. Working with formulas may be easier than "winging it". But the "easy" way is usually the way to failure. Believe me, when it comes to rate negotiation, you want to know what you want and then be as flexible, open, sensitive and knowledgeable as you can possibly be. It might appear as if formulas would be more effective than "winging it"; but trust me, if you get locked into rigid formulas, you may lose your ability to effectively negotiate and end up losing some big bucks. In Part I, I mentioned that a shipper wanting "back haul" rates is akin to wanting to pay peanuts. They have no intention of paying a competitive rate. But ask any truck driver or fleet owner, "Is it any cheaper to run back hauls as compared to going out bound?" The answer would certainly be NO. The same costs are with a trucking company regardless of which way they happen to be going. The shipper's idea is that a truck is more anxious to "get back home" and, therefore, the truck will take less pay. This may be, and probably IS true, for some truckers. Besides urgency, some trucks take loads that are less than their cost because they feel that taking something is better than nothing. Then some don't even know what their true costs are. So, sometimes a truck is just stuck without a load for several days and he or she is anxious to get moving and make some money. I understand this. But, when a truck takes less than a competitive rate, they hurt themselves and the industry in the long run. It's a matter of building your own orchestra of shippers where you can go directly to them without all the hassles of working with brokers who tell you, "Take it or leave it". This whole idea of competitive rates is dealt with in our training in detail. It can get complicated and there is a huge difference between carriers and freight brokers seeking competitive rates. In Part III, we will take a look at this. I have a lot to say about giving quotes, or rates, to shippers in my training. There may be some confusion surrounding all of this "rate" stuff. But, when a shipper asks you for your "back haul" rates they may as well ask you for the "down and dirty lowest rate that a desparate truck driver will take". Again, there may be some confusion around all this with number one being: 1) it makes a whole lot of difference if you are giving rates to set up a contract for a dedicated number of loads versus giving rates for spot loads around the country. 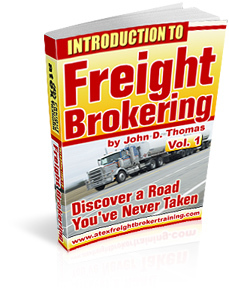 This is something of importance to both truckers and freight brokers. In Part II, I will continue this.